TGx:Details for torrent "[Team-FCW] Learning BIM 360 Design"
Torrent details for "[Team-FCW] Learning BIM 360 Design"
For teams using Revit, worksharing enables multiple users to access, and make changes to, a single Revit project simultaneously. 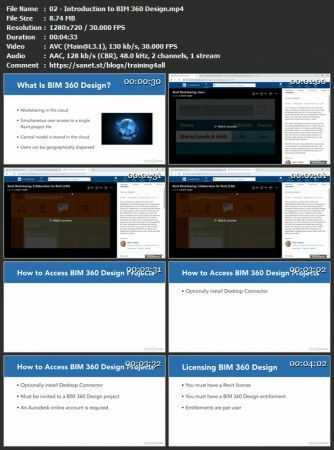 Using BIM 360 Design, you can extend worksharing to the cloud. In this course, Paul F. Aubin explores how using BIM 360 Design allows you and a team of coworkers to store your central model in a secure, cloud-based hub and work on it as if it were stored on your local server. This makes it easy for firms with distributed teams across multiple physical offices to work together seamlessly. Plus, the functionality of BIM 360 Design leverages the cloud-based team sharing solutions from Autodesk, which means that your Revit models and other associated project files can be made accessible to all stakeholders in a secure environment complete with granular permissions.